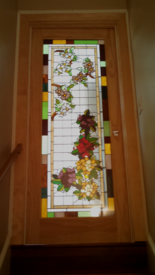 At Cedar House Stained Glass, our attentive staff is available Monday through Saturday to answer all of your questions and ensure you are 100% satisfied. I have chosen stained glass as my medium for expression because I have always found stained glass windows to be relaxing and tranquil. I enjoy the creativity of designing windows to complement the room, décor or personality of the setting. As different light hits the glass at various times in the day, it is fascinating to me how the artwork changes. Although I always enjoy the finished product, I enjoy even more the process of creating an original window. I choose a frame that I find interesting, an antique, or something complementary to a specific room. From there I design the window to complement the frame and the room in which it will hang. I enjoy the manual part of selecting and cutting the glass, foiling and then soldering the glass, and applying the finishing touches. Each window has its own story and message.